The barbell weight should be something that you can do all reps unbroken while you are fresh but doing so on the workout would be more challenging and most likely broken up in some form or fashion. 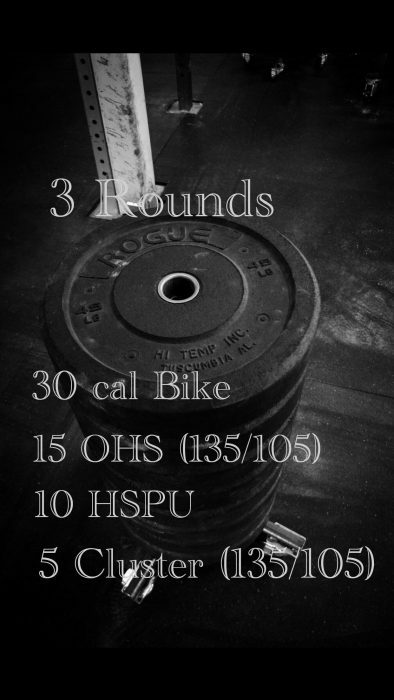 Goal is still to have you able to get the OHS done in more than 2 sets on any round. Adjust loading as needed in order to accomplish this. If you need to modify the strict HSPU start off with lower reps, then go to a banded option or even a “Z” press if needed. Clusters will most likely be in singles unless you like chewing on barbells.